Selwyn House is a homewares brand, with every piece designed and made by Sean Best and Ellie Smalls, in Derbyshire, UK. We specialise in creating beautiful objects for your table, born from a love of gathering together to share everyday food and family feasts. We're food-lovers at heart - if we're not thinking about food, we're thinking about the tableware to eat it at! We met a little over 10 years ago at Leeds College of Art (now Leeds Arts University). A few years, house moves and jobs later, and the call to live a more creative life finally caught up with us. Selwyn House is a real place, a home with history and warmth and character. It seemed the perfect name for everything we wanted our pieces to embody - it’s special, but it’s everyday. It’s got elements of traditional style, but it stands up to modern living. Even more perfect is the fact that ‘Selwyn’ roughly translates as ‘friend in the house’. All our wooden products are made individually, by hand, by Sean. We carefully hand-pick all our wood to ensure it has the look and quality we strive for. We try to use as much English timber as possible and look to find wood with provenance. Often our wood is from felled trees which are local to us and products are limited to individual pieces or very small batches. The wood is processed from rough sawn boards to the finished product, taking care to utilise the wood's grain and characteristics to get the best pieces from each board. All of our turned items are individually turned on the lathe from single blocks of timber. 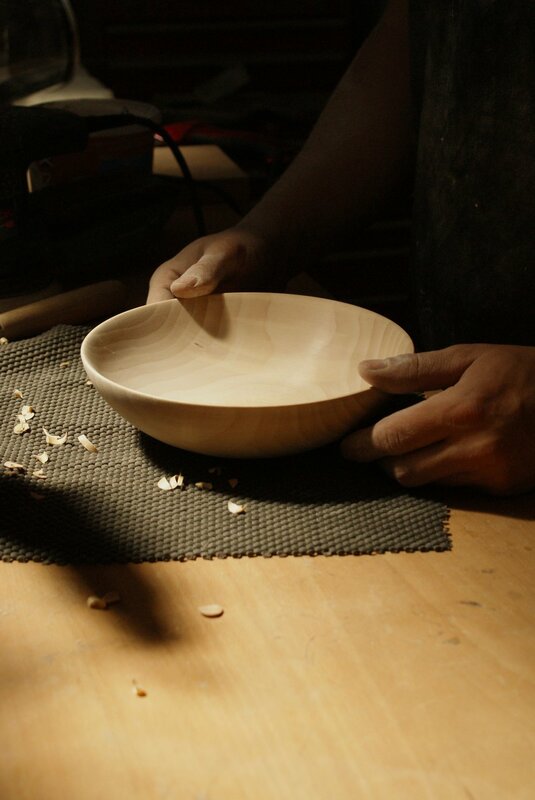 Often it is the wood that dictates the shape of the bowl. All items are hand sanded and finished with food safe oils and waxes, carefully chosen to complement not only the look of the piece but also its intended usage. To find out more about how to care for your wooden pieces, see our Care page here. All our table linens are designed and hand-printed by Ellie. Designs are refreshed seasonally and are developed through sketching and collage. Each design is then cut by hand into lino and test printed, where it often undergoes several changes to make it work in repeat. Once finalised, the lino is mounted onto wooden blocks and is ready for printing. We use water-based textile inks and mix the colours for each batch by eye. The design process often begins with a specific colour palette, so mixing our own colours is important to the feel of the finished pieces. We primarily use a medium weight linen mix fabric woven in Scotland for all our napkins and runners. This high quality fabric means we can offer both great prints and a natural, soft textile base which will withstand use and washing. If you’re interested in becoming a stockist, please fill in the contact form, or just email info@selwynhouse.co.uk.